Please note this scheme is not currently running. It operated in 2013 thanks to the herculean efforts of a couple of members who did most of the organisation between them; one of these has now left the UK. The scheme was designed round an ordering system which many found too complex to use, and which was time consuming to maintain. The coop needs new volunteers to develop a simple ordering system and administer it. Get access to organic and good quality food at affordable prices here! 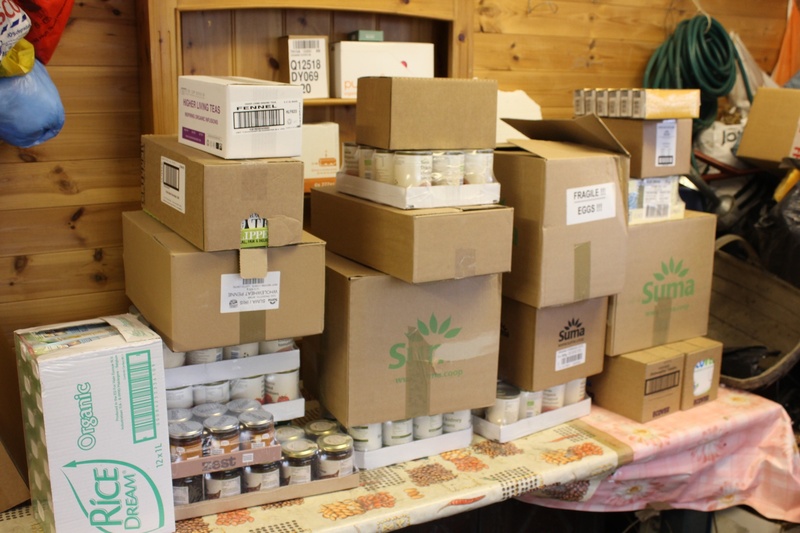 Transition Walthamstow’s Food Coop enables us to put in a large order for food, and other household items, and be able to buy this at wholesale prices. Suma provides what is often known as ‘wholefood’, they stock much organic and fairtrade food and have values that match those of Transition. Although Suma are not local, they are a good starter base for us to launch from, they have a team of staff that are used to helping buying groups use their services. They already make deliveries to businesses in the area (including the Hornbeam Centre!) and would fit our delivery into their area schedule, thus limiting the transport impact of increased fossil fuel use and carbon emissions. a few of us get together to sort and stack the items for everyone’s individual orders. members collect their food between 3 & 5pm the following Saturday from the pickup point in Walthamstow Village. All you need to join is the scheme is a google email address, and membership of the Coop costing just £5 (which pays for boxes to store your food in). The scheme relies entirely on voluntary effort, so members are asked to lend a hand when required. As we do this and get used to the process, we will be able to put together a resource to help others who would like to buy their store cupboard food in this way. We will be developing our knowledge of better ways to access good food and we will be able to share our experiences with others. Note that you can buy wholefoods in Walthamstow at Second Nature, which is located at 78 Wood Street E17 3HX 020 85207995.